The Foundation Dinner is an annual fundraiser designed to support a specific church or missional need. The event includes dinner, entertainment, live and silent auctions, and the opportunity to enjoy off campus with new and old friends. 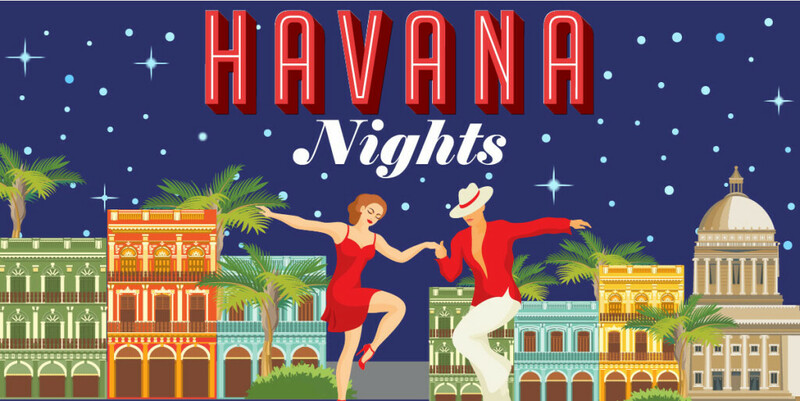 This year, our theme is Havana Nights - so get ready to don your favorite panama hat and salsa your way through the night! Learn more or volunteer on our committee by contacting the Foundation office at 480-991-6424 ext. 168. This year for the convenience of our guest, we've employed GiveSmart, a site designed to put payment and bidding in the palm of your hand. View and bid on items weeks before and even during the event! 2018 - Raised and donated $57,000 to Family Promise of Greater Phoenix. 2017 - Raised $40,000 for the removal and replacement of major kitchen appliances in Landes Center. 2016 - Raised $70,000 for the new landscape design and installation on the eastside of the Chapel, purchased a new monument sign at McDonald entrance, and remodeled the men and women's restroom on the north side of the Sanctuary. 2015 - Raised $70,000 for Kilgore Chapel roof repair, purchased new chairs for Landes Center, and funded significant campus water pipeline replacement. It is an honor to serve as President of the Valley Presbyterian Foundation for 2019. As a member of VPC, I have come to appreciate the role of the Foundation in assuring the financial security of our church. Forty-one years ago several wise members of our church community thought it appropriate to establish the Foundation and today it is a reliable resource for our church to sustain its capital needs, music program and mission ministries. Foundation-funded improvements have included maintaining the Memorial Garden, re-configuring the Fireside Room and the Crossing, repairing the roofs and air conditioning units, refurbishing restrooms, and landscapes throughout our 10-acre campus. The Foundation endows a variety of programs and activities aimed at enriching our congregation’s faith walk with the Lord. Examples of these include the our free concert choir shows, student and mission trip scholarships, and Stephen Ministry and Deacon Ministry support. With great appreciation for faithful service, the Foundation manages the retirement distributions for former Senior Pastors Tom Erickson and Woody Garvin. The Foundation consists of 12 trustees who serve staggered three-year terms. With trust funds of 4.6 million dollars, we utilize a professional investment management arrangement that includes two outside investment advisory firms as well as an investment committee of advisors from within our church membership. Additionally, two staff members, Kris Bahr and Charlee Turner, assist the Foundation throughout the year. I encourage you to learn more about the Valley Presbyterian Foundation, the Legacy Society, and our Annual Foundation Dinner. You can reach out to me, any of the trustees, or members of VPC’s staff. For information on how you can participate, email the Foundation Office or call 480-991-6424 ext. 168. You can also reach out to Development Director Sam Kelsall at 602-234-1999. Boots and his wife Kirsten have attended VPC since their early childhood and now have the distinct pleasure of sharing this wonderful experience with their three children. In addition, some of Boots’ fondest memories took place in the main sanctuary where he first earned his Eagle Scout and seven years later went on to marry Kirsten, his childhood sweetheart. All of these, with his faith, contribute to his family’s dedication to the success of the Church and Christ’s mission within it. Boots is currently the CEO of RRA, a national commercial real estate finance investment firm. Prior to business, Boots served as a US Army Infantry Officer for 10 years where deployed to Iraq and Afghanistan. Boots is a graduate of the University of Virginia. I have been a member of VPC for 18 years. In that time I’ve served as trustee of the Valley Presbyterian Foundation for three years, and served as President of VPF for two years. I started the Foundation’s Legacy Dinner 12 years ago. I currently serve as Director of Development of VPF. I’ll serve on any group that promotes gardening in South Phoenix. I strongly believe in teaching people to fish rather than handing out fish. It has been my honor and pleasure to serve the Lord through different capacities at VPC. Originally I lived in Pittsburgh, where I was an Elder before being transferred to Arizona. We joined VPC approximately 10 years ago and have attended the Contemporary service. Presently I am involved in Encore University, Stephen Ministry, am a Deacon and on the Worship Committee. In addition, I am a receptionist one or two times a week and through the Deacon's I have driven people to doctor appointments, etc. There are other little sundry things I get involved in and I truly enjoy each and every thing I am involved in at VPC. I am looking forward to serving on the Foundation Committee for the next three years. I have been a member of Valley Presbyterian Church since 1974, and feel privileged to call my church "family". I have served on Session, and look forward to serving for a second time as a Trustee. My "Early Birds" bible study group has been meeting for over thirty-five years, and these wonderful women have played an important part in my life. I have been on a woman's board for Gomper's Rehabilitation Center, & The Friends of the University of Arizona Cancer Center. Working in the field of interior design has been a career & passion. Having the opportunity to be on the building committee with Bob and Louise McCall during the construction of our chapel was a highlight as a designer & church member. I raised three children at VPC, & now attend with grandchildren. The future of our church is exciting, & I look forward to being a part of it. Beth Allen joined VPC shortly after arriving in Phoenix in 2005. She has been active in discipleship, missions, women's ministry, and music ministry. When she isn't in church, Beth serves in the marketing department of the international Christian relief and development organization Food for the Hungry, in the Phoenix headquarters. Beth frequently travels overseas as part of her work and lived in Bolivia for several years. Daniel Gonzales was born and raised in Central Phoenix and he can boast that he is a third generation Arizonan as both sets of his Grandparents were born here when Arizona was just a territory. These roots have given Daniel and his family a deep appreciation and love for the community of Phoenix. Daniel and his spouse of 30 plus years Sandra have three adult children, Robert, Laura and Katherine who were all baptized at VPC. They are active members of Valley Presbyterian Church and Daniel serves on the Board of Trustees for VPC and MentorKids USA. Daniel has been in Financial Services and Banking in Phoenix for 25 plus years and is a Vice President for Alliance Bank of Arizona. I have attended services at VPC since 1998 and been a member since 2009. I have served as a Lay Hospital Chaplain for eight years and a Deacon for three years holding these positions: year 1 as Chair, Deacon Fund and years 2 and 3 as the Deacon Moderator. Professionally, I was the Founder, President, and Corporate VP of Caremark Prescription Services, and served on the CVS Board of Directors for 14 years. Luke Livak is the Vice President and Chief Financial Officer of Loftin Equipment Co. He is a long-time Arizonan, having grown up in Tucson and living there for most of his childhood. Family is the most important thing in Luke's life. He married his wife Molly in 2010 and they have four young children: Alice, Khaki, Andrew, and Jane. The Livak family believe strongly in being active members of the community, supporting several causes including Fighter Country Partnership's Blue Blazer Squadron of which he is a member. The group aims to support airmen and mission of Luke Airforce Base. Brent Nichols joined Valley Presbyterian Church in 1991 and reaffirmed his membership in 2018. Richard and his wife Kathy joined Valley Presbyterian Church in 2001 through a friendship with Robert and Louise McCall. They moved to Arizona on a work assignment to run a business jet propulsion overhaul facility with Air Research Manufacturing Arizona. The Schullers have two children, three grandchildren, and a great granddaughter. In their own business, they work globally in the aviation private jet market. They most love the Chapel for its stained glass, Light of the Universe design by the McCalls. Lamont Yoder and his family joined Valley Presbyterian Church in 2010 after moving from Ohio to Arizona. Growing up in the Mennonite church, Lamont spent his adult life serving in multiple roles in the Presbyterian church in Ohio, and at Valley Presbyterian as Deacon and on the Student Ministry Nominating Committee. Lamont serves as a CEO of three of Banner Health hospitals and the Banner MD Anderson Cancer Center. He has served on numerous non-profit and foundation Boards locally, regionally and nationally, currently including the Forbes Artificial Intelligence Board, the American Hospital Association Innovation Board and the American Organization of Nurse Executives Foundation Board. Lamont and his wirfe Charlene breed and show Cavalier King Charles Spaniels, and Lamont is an international dog show judge. It is an ancient custom to have a burial ground near a Church. It is sometimes referred to as 'God's Acre' and considered sacred ground. The Memorial Garden was dedicated November 27, 1977. Reverend L. Wilson Kilgore conducted the dedication. Memorial Garden – providing a serene setting for those grieving the loss of a loved one. Music & Arts Ministry – providing unique performance opportunities for children and adults. Piano Music Lab – featuring nine state-of-the art synthesizers. The Legacy Society helps provide a long-term foundation for VPC. Members of the Legacy Society desire to continue God's work past their lifetimes to growing as a Church and to spread God's love to our congregational and community members for years to come. There are no start-up or annual fees. Simply name the Foundation in your estate plan or will. A will is the cornerstone of a well-organized estate plan, but it can also proclaim your Christian faith, demonstrating your faithful stewardship to future generations. The Valley Legacy Society is composed of members who have designated the Foundation in their wills or trusts. If you're ready to become a member of the Valley Legacy Society, simply print the form below and return it to our Foundation office. A Trustee will contact you soon! Barbara Patterson Gift- Foundation Sunday 2018 from Valley Presbyterian Church on Vimeo. Thank you to all of our Legacy Society members for investing in the future of our shared faith! Students please remember, the deadline for this next year's scholarship applications is May 2019. Valley Presbyterian Foundation is proud to assist our college students in their educational endeavors as they prepare for productive and faithful lives as God's children. Our scholars have served their church and community by displaying their faith and using their God-given talents. Our goal is to offer a greater financial help in the future for students requesting help in furthering their studies to attain their career goals. Erickson Scholarship Application and Guidelines- supplements financial assistance for college and seminary students. Kurz Scholarship Application and Guidelines- financial support for college juniors, seniors, or graduate students who have been active VPC members for at least three years. Simmons Scholarship Application and Guidelines- provides financial assistance to graduating seniors for purchase of books.